Our weaving team has the ability to reweave many textiles, from holes in the field, to side and end reweaving, to replacing wool knots in worn areas. 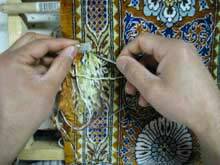 The cost and turnaround time varies with the type of materials and knot count. 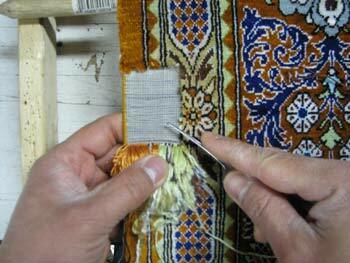 We have several experts in rug repair and restoration on staff. 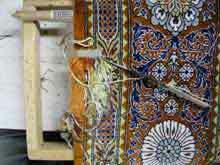 We specialize in antique repair and can take care of minor conservation measures such as wrapping sides as well as complete restorations and re-weavings. Small holes and tears in the center of a rug can be caused by many things – excessive foot traffic, furniture friction (rolling chairs), planter water damage (dry rot), or just old age. Regardless of the cause, the area needs immediate attention to ensure further loss of knots is avoided. Embroidery stitching can strengthen small worn areas to protect fragile foundation fibers from further friction. If the hole is significant, then patching or reweaving will be needed. 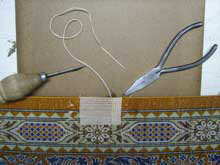 Selective dyeing is a “cosmetic” repair to make your rug look better. 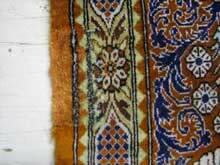 Permanent textile dyes can be used to blend away worn areas, discolored areas, white knots, and repairs. 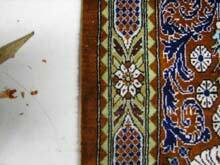 On collectible rugs dyeing beyond some small particular areas can affect the value of the rug. We will share the positives and negatives in these situations so you can make an informed decision. If there is limited fringe damage (some torn tassels, but the entire end is not worn), then new tassels can be strung into the rug to replace the missing warp strands. Also, if you do not like the “look” of the replacement (prefabricated) fringe, this is an option.